The Great Strike of 1913 was in fact a series of strikes between mid-October 1913 and mid-January 1914. It was one of New Zealand’s most violent and disruptive industrial confrontations. Between 14,000 and 16,000 workers went on strike, out of a population of just over one million. 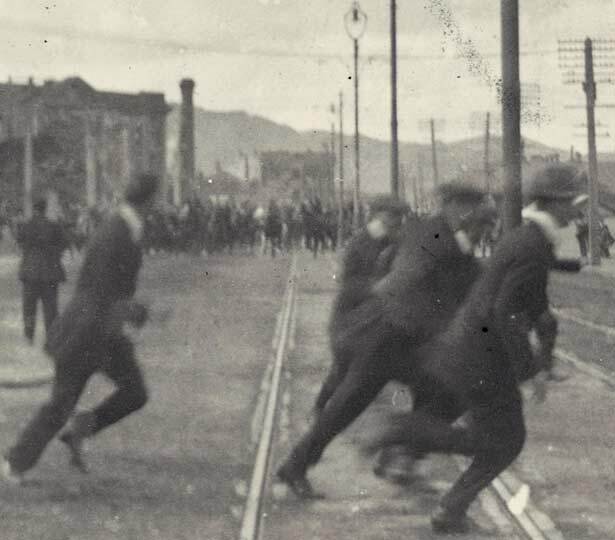 The strike wave of October 1913 began with two relatively small disputes: one at a Huntly coal mine, the other on the Wellington waterfront. The key issue of the Great Strike was a power struggle of militant unionists against organised employers and farmers, backed by the government. Most of the striking unions were affiliated to the United Federation of Labour, the ‘Red Feds’. They had withdrawn from the country’s arbitration system in favour of direct negotiations with employers, during which they had the right to strike. The strikers were opposed by the New Zealand Employers’ Federation and the Farmers’ Union. Farmers and rural labourers formed the core of the mounted special constables, who were known derisively as ‘Massey’s Cossacks’. The specials were sent into the main urban centres to open up the wharves. Prime Minister William Massey’s Reform Party government gave full state backing to defeating the striking unions. The strike began with watersiders’ and miners’ unions. They were later joined by seamen, drivers and builders’ labourers. The strike affected most port towns and coal-mining settlements. Generally the ‘moderate’ unions – those still participating in the arbitration system – refused to join the strike. In Auckland, however, there was a general strike from 8 to 22 November, involving arbitrationist as well as Red Fed unions. We have 9 biographies, 8 articles, related to The 1913 Great Strike.